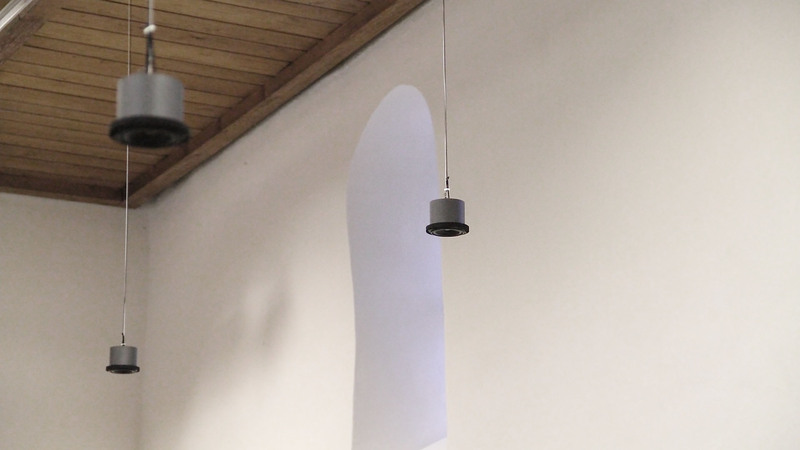 In the central nave of the small 14th century Saint Servatius church of Groot-Loon, 'Proximity Effect' aims at the acoustic qualities of the interior as well as at the public and private life outside, in a wide circle around the church. An aluminium construction, on which a total of 15 loudspeakers is mounted, is secured to the church roof at a height of about 5 meters. The speakers emit individually modulated tones, each representing a frequency corresponding to the resonance pattern of the space. The volume is low. Each time a visitor enters and moves around the church, sensors, next to each speaker, register the presence of that person. As a result, the speaker lowers to that person to a height of two and a half meter. The sound gradually changes from the given tone to a pre-recorded sound, previously recorded in the environment. After two minutes, the speaker cable is wound up again and after a stop halfway, the speaker proceeds to its original position. 'Proximity Effect' emphasizes the sonic presence of the architecture in its entire historic connotation and captures the visitor in an intimate sphere that resonates with its surroundings. Aluminium construction, stepper motors, Arduino, infrared sensors, PC (software: Max MSP), 15-channel speaker system.